There is a new property available from 11.1.2.2.300 to change the default homepage view when you first log into Planning. The default view can be changed at application level from Task List to be either Forms or Approvals. Restart the planning web application server. If a user then logs in it should display the default view of Forms. If you want to change the default view to “Approvals” then just add that as the property value and restart. The application default view should then be Approvals and if you want to set it back to Task List then delete the property or update the value to “TaskList” and restart. This is one of those blogs that has been in the back of my mind for ages and I have never been sure whether to write up, maybe because it is about online help and that is enough to send anybody to sleep. From 11.1.2.2 the way help is delivered has changed and to be honest I know it is all over the documentation but I think through my own ignorance I pretty much ignored the following statement. I hardly use the help that is accessed through the various products and I tend to go directly to the EPM documentation library which has everything all under one roof. Another reason for installing the help locally might be external internet access is restricted or you might find it useful to have it to hand on say a personal or training VM image, you could even install the help locally and leave it dormant so if it is required at some point it can be enabled. Selecting “Online Help” opens a browser window and redirects to the Oracle documentation web site. The redirection to the Oracle web site is controlled by including the mod_rewrite module in OHS and using the RewriteRule directive. If you open the configuration file there will be a line that has the following Include directive. The include directive basically means that the contents of the epm_online_help.conf file are also read in when the main OHS configuration file is accessed. The epm_online_help.conf file contains all the rules for the online help and uses the RewriteRule directive to redirect the requested help URLs to the corresponding location on the Oracle documentation site. 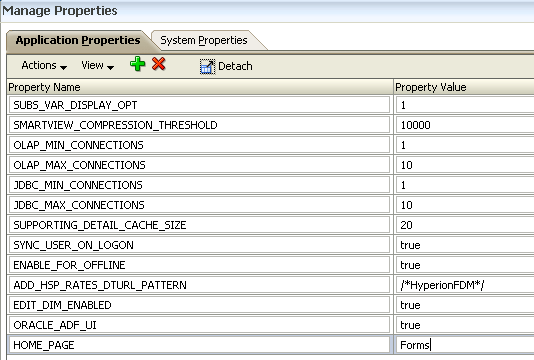 The EAS rule has the syntax to match all requests from /epmstatic/eas/docs/ and apply a permanent redirect (R=301) to the oracle URL, the L parameter means that it is the last rule so need to carry on trying to match. You will notice that is not the final URL as it is then redirected again internally on the Oracle site to the correct documentation location. Another example of this functionality in action is the Reporting and Analysis help accessed within Workspace. If you run a fiddler session while accessing the help you will be able view the redirection happening. This is then redirected by Oracle to the relevant location on the documentation site. Anyway say you don’t want to use the online help and need to install and configure the help to run locally, well you would think there might be an option in the installer and the files would be available with the rest of the EPM files in the Oracle Software Delivery Cloud but no the help can be downloaded as a zip file from http://download.oracle.com/docs/cds/epm11122.zip , I am not sure if this file is kept up to date with any changes to help documentation. Going back to the statement in the documentation ““reduces the download and installation time for EPM System”, it took me only a few minutes to download and extract the 540MB zip file so I am wouldn’t really say it reduced the time by a noticeable amount but I understand this can depend on network connection. 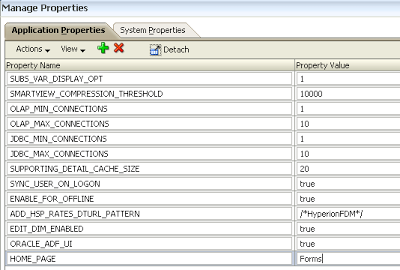 Extract the epmstatic folder to <MIDDLEWARE_HOME>\EPMSystem11R1\common on the HTTP server to merge the help documentation into the existing epmstatic directory. Comment out the line which has the include directive to the EPM online help configuration file and then restart the services. Accessing the help documentation should now be via the files stored on the HTTP server. Back with another quick blog that was inspired from a post on the OTN forum, the poster raised an issue when changing the account to manage the OPMN windows service. The issue relates to starting the Essbase OPMN service but I believe it is valid for any of the 11.1.2.x EPM OPMN services. After the initial configuration of Essbase an OPMN windows service will be created and set to be controlled by the Local System account. Say you change the Log On account for the service to different account to the one that configured Essbase, the issue will not occur if it is the user that configured Essbase which I will explain why shortly. Attempting to start the service should now fail with the standard timeout message. 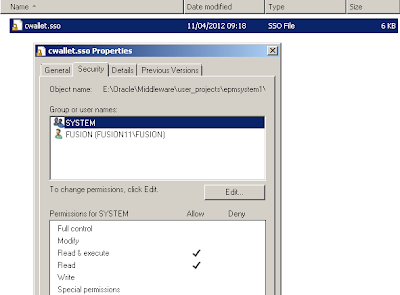 When OPMN starts it attempts to access the Oracle wallet file cwallet.sso in the above location and fails, so why does it fail well if you check the security properties of the file you will see. 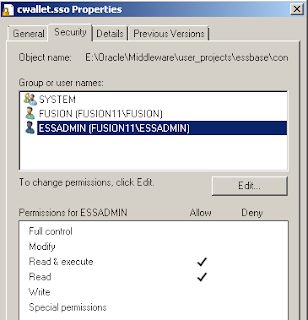 The only accounts that have access to the file are the SYSTEM user and the user that originally configured Essbase which in my case is FUSION so the user that I configured to start the OPMN service will not have access to the file which ends up causing the failure. The simple solution is to add the account with read permissions to the wallet file. The OPMN service should now start without any problems.